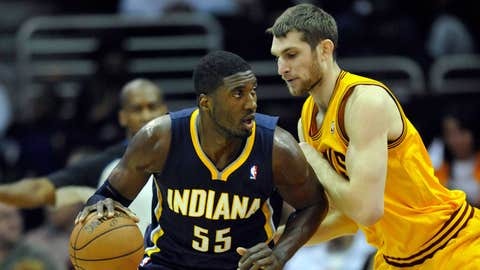 Indiana Pacers center Roy Hibbert dribbles against Cleveland Cavaliers center Tyler Zeller in the first quarter at Quicken Loans Arena. CLEVELAND (AP) — Paul George scored 16 points, Roy Hibbert made a putback and two free throws in the final 1:09, and the Indiana Pacers held off Cleveland’s late rally for an 82-78 win over the short-handed Cavaliers on Sunday night. The Pacers led by 16 in the fourth before Dion Waiters brought Cleveland back by scoring 12 points in a 16-1 run that got the Cavs within 75-74 with 3:35 left. Hibbert’s free throw with 7.9 seconds left put the Pacers up 81-78, and Indiana got the ball back when Cleveland’s Earl Clark stepped out on an inbounds pass 1 second later. David West made one free throw with 5.4 seconds left, and the Pacers escaped with their seventh win in eight games. At 27-6, Indiana has the NBA’s best record. C.J. Miles scored 21 and Waiters had 14 for the Cavaliers, who played without All-Star point guard Kyrie Irving. He missed his third straight game with a bruised left knee. The Pacers had to grind this one out after taking control with 14-0 run bridging the third and fourth quarters. Lance Stephenson made a 3-pointer as Indiana, seemingly on cruise control during several long stretches, closed the third with a 7-0 run and then extended the lead to 16 by opening the fourth with another 7-0 burst capped by Danny Granger’s 3 that made it 74-58 with 9:39 left. 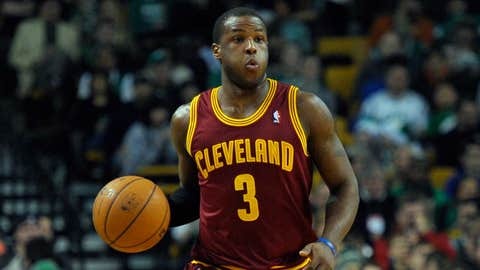 That’s when Waiters, the subject of trade rumors for weeks, brought the Cavs back. He scored 12 straight points and fed Anderson Varejao with two nice assists to get the Cavs within 79-78. Hibbert split a pair of free throws, but on Cleveland’s next trip, Waiters missed a 3 and then tried to force up a layup in traffic that didn’t hit the rim. Hibbert’s free throw gave the Pacers a two-point cushion, but Cleveland couldn’t execute a simple inbounds pass without a turnover and West put it away with his late free throw. Hibbert added 15 points and West 11 for the Pacers, who shot just 36 percent from the floor but played their typically tough game on defense. Indiana has won nine straight over Cleveland and 15 of 16. Tristan Thompson added 13 points and 10 rebounds for the Cavs. Irving’s absence was compounded by Cleveland also being without his backup, Jarrett Jack, who sat out with back spasms. As the Cavs played with their top two point guards, there were continuing reports that the club was in active talks with the Los Angeles Lakers for a trade involving Andrew Bynum for Pau Gasol. The enigmatic Bynum was recently dismissed from the team for detrimental conduct and the Cavs would like to deal or release the 7-footer by Tuesday, when his contract will be guaranteed. The injury-ravaged Lakers would consider bringing back Bynum — he spent seven seasons with Los Angeles — so they could cut him, clear salary-cap space and avoid paying the luxury tax. Bynum’s deal is worth $12.3 million this season, but if a team waives him by Tuesday, it will owe him nothing because the $6.3 million left is not guaranteed if he’s released by Jan. 7. Cavs general manager Chris Grant did not sit in his customary seat during the first half, fueling speculation that a deal could be coming. The Pacers, who fell behind by 14 before rallying to beat New Orleans on Saturday, shot only 37 percent in the first half, but used a 9-2 spurt to close the second quarter and lead 44-35 at the break. NOTES: Indiana came in allowing a league-low 88.9 points per game. … Cavs coach Mike Brown would not comment on the trade rumors swirling around his team, and particularly about Bynum, who was banned from all team activities on Dec. 28. Waiters and Varejao have both been mentioned in various deals. … Pacers coach Frank Vogel says his team is a target every time it takes the floor. "It’s not so much that they’re gunning for us," he said. "I think everybody looks at us and says, `If we beat the Pacers, that’s going to be a quality win.’ You do get their best shot from that standpoint. Teams recognize that you have to play a great basketball game to beat us."